Askinosie buys beans directly from small farmers. The goal: better quality control, and more cash to the growers. 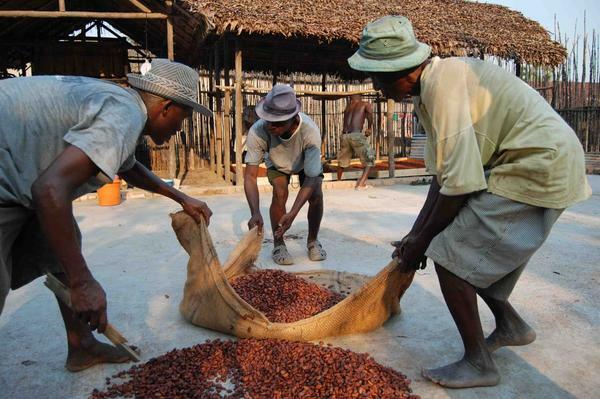 Workers in Madagascar prepare cocoa beans for drying. The process has a big effect on the quality of the finished chocolate. 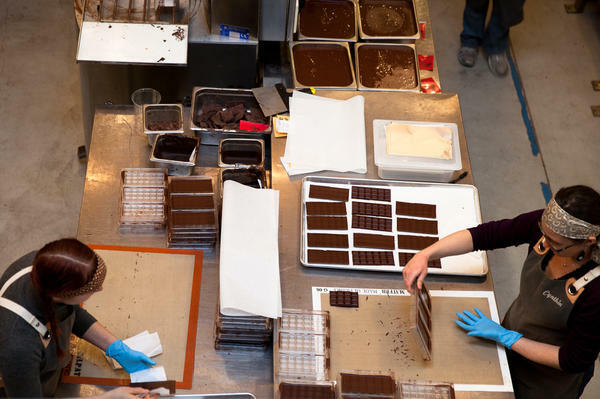 The Dandelion Chocolate factory has an open workspace where patrons can watch--and smell--the chocolate as it is ground, conched, formed into bars, and wrapped. 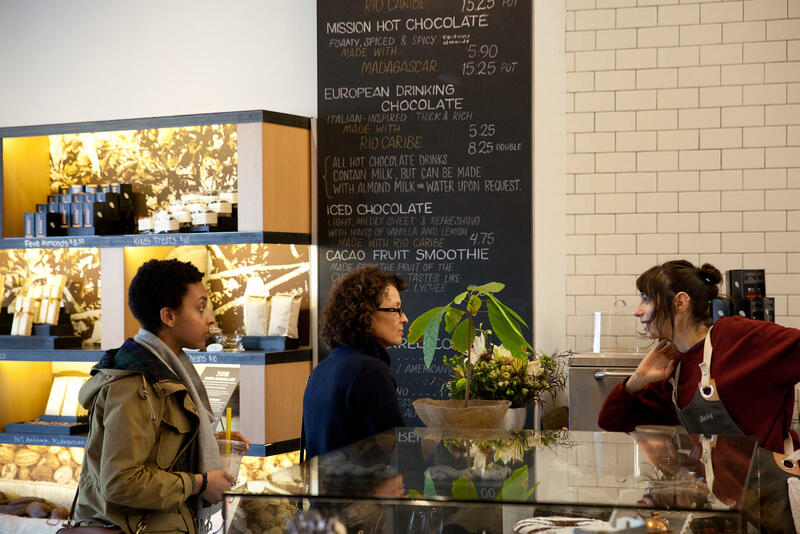 Dandelion Chocolate lures customers into its San Francisco factory with a cafe and store. Co-founder Cameron Ring says most people don't know how chocolate is made, even if they eat it every day. Is it chocolate yet? Customers can test the finished product on the spot at Dandelion Chocolate's storefront cafe. 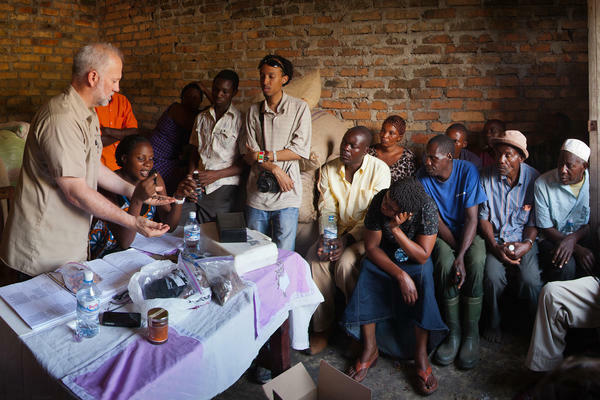 Shawn Askinosie, founder of Askinosie Chocolate, buys cocoa beans directly from farmers, like this Uwate cocoa farmers group in Tenende, Tanzania. Dealing direct "impacts the flavor of chocolate, and it brings the consumers closer to the producers," Askinosie says. 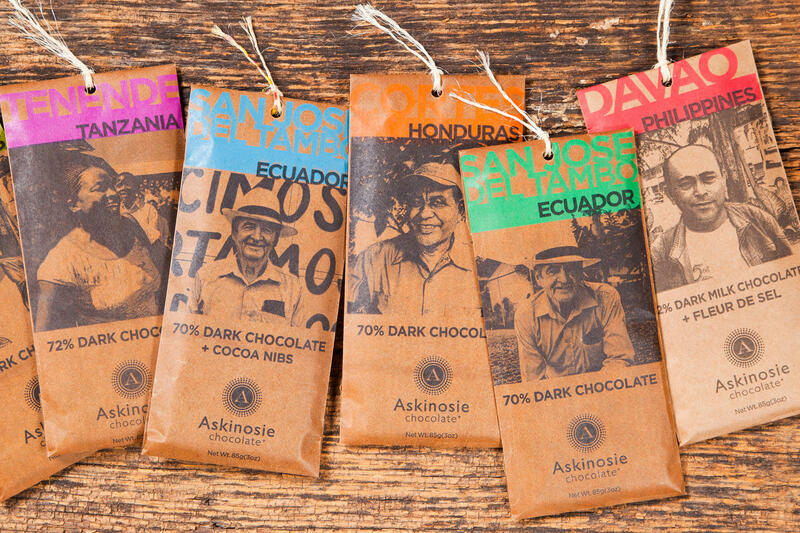 Askinosie Chocolate, launched six years ago, is one of the pioneers of the bean-to-bar movement. Bars are made with beans from single regions, or a single farm. 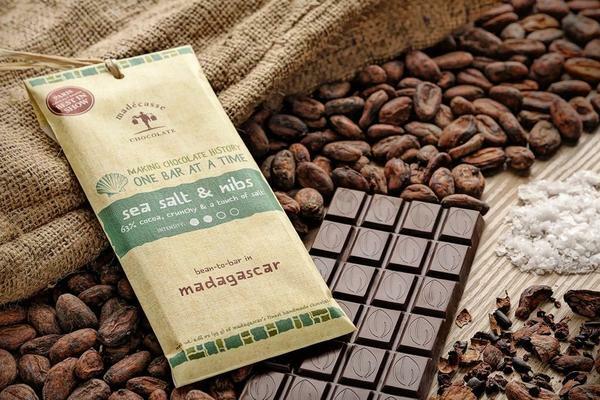 The founders of Madécasse sought to base the entire chocolate-making process, from farm through factory, in Madagascar. The goal: keep jobs and cash in Africa. If you're looking to buy chocolate in San Francisco this Valentine's Day, just follow your nose down Valencia Street. "A lot of people walk in [and say], 'Oh, my gosh, the smell!" says Cameron Ring, co-owner of Dandelion Chocolate. That lush chocolate scent is wafting from a new factory that's smaller than many two-bedroom apartments. The floor plan may be modest, but the olfactory output is huge. And it's not just the sweet perfume of freshly tempered chocolate. Just-ground cocoa beans exude an acidic tang that fades in a day or two, to be replaced by that classic chocolate aroma. The grassy, acrid smell of fermented cacao beans is even less alluring. They're sequestered in a sealed room that vents outside. "Chocolate is one food where everyone is familiar with it, but it has this untold story," Ring says. As part of the growing bean-to-bar chocolate movement, he wants to tell that story. Thus the factory in a high-traffic area of downtown San Francisco, with a small store and cafe up front that lure customers in to see the whirring machines in the factory beyond. Dandelion imports chocolate from individual farms in the Dominican Republic, Venezuela and Madagascar. The bars are simple, made with just cocoa beans and sugar. They are meant to be tasted and compared, akin to a wine tasting or coffee cupping. Ring, a former Silicon Valley entrepreneur who co-founded the social networking site Plaxo, says: "The beans are the stars of the show." By controlling the chocolate-making process from the farm to the bar, bean-to-bar chocolate entrepreneurs say they can create better chocolate — chocolate that preserves the beans' distinctive flavors. Many also hope that the farm-to-bar pipeline will make for more ethical, sustainable production in an industry with a long history of exploitation. 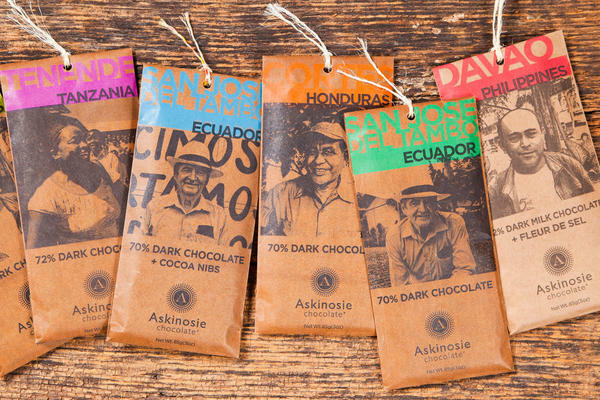 "I actually go source these beans myself on four continents, directly with farmers," says Shawn Askinosie, founder of Askinosie Chocolate, based in Springfield, Mo. "I pay them directly. We pay them above-market prices. Then I go back with my financial statements, translated in whatever language they need, and profit-share with them." That financial transparency pays off, Askinosie says, because farmers are motivated to test and perfect their drying and fermentation methods, which have a huge influence on chocolate flavor. But making chocolate that way isn't cheap. A 3-ounce Askinosie bar, made from beans bought from farmers in San Jose del Tambo, Ecuador, will set you back $8. And it's not easy. Askinosie, a former criminal defense attorney, decided to try making chocolate from scratch after getting into baking as a midlife hobby. "Four months later I was in the Amazon," he says, buying cacao beans from subsistence farmers. He soon became a cocoa bean exporter, in an industry that he says is 20 years behind the coffee trade in terms of sophistication and efficiency. "I have tried murder cases, and those are pretty stressful and challenging," Askinosie says. "This, dealing with farmers and importing, is a lot more stressful and challenging." Still, Askinosie says he's making a profit. "We know this direct-trade with farmers model works. All we have to do is look at coffee to prove it," pointing to Chicago's Intelligentsia Coffee, which pioneered buying beans direct from growers. Askinosie also makes a point of investing in the communities at both ends of the chocolate trail. His company funds lunch programs that feed 2,000 children a day in the Philippines and Tanzania. Back home in Springfield, he teaches entrepreneurship at public schools near the storefront factory. Bean-to-bar entrepreneurs see direct trade, despite its frustrations, as a solution to what they perceive as the shortcomings of fair trade certification, which relies on third-party oversight. Those certifications have become controversial in the coffee industry, as huge roasters like Starbucks and Green Mountain start touting fair trade credentials. But that also means that chocolate fans need to get up to speed on the often murky differences between fair trade and direct trade. 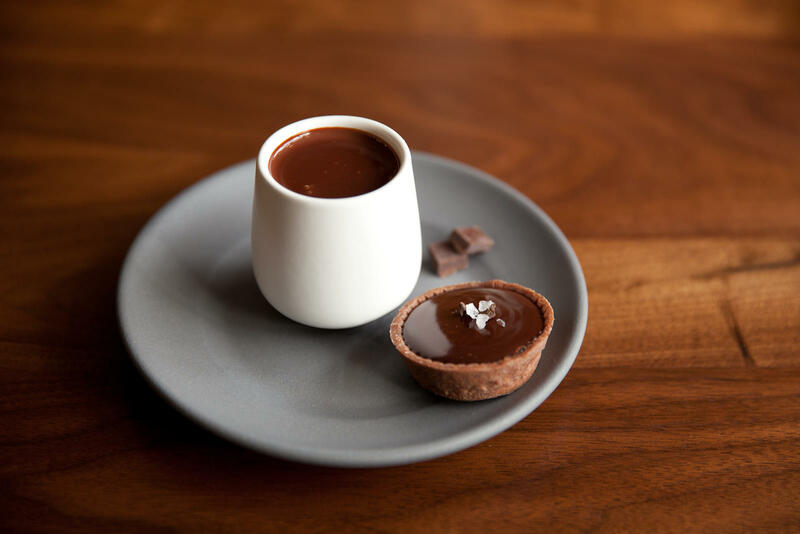 "Almost all the bean-to-bar chocolate makers are doing pretty good work, paying their farmers above-market prices," says Clay Gordon, a chocolate consultant and author of the Chocolate Life blog. "Most of them are choosing not to pay $8,000 to $10,000 for certification. They're paying that to the farmers." Madécasse Chocolate is experimenting with another twist in bean-to-bar — keeping production in country. "We saw that there was a gaping hole in the chocolate production system," says Tim McCollum, a co-founder of Madécasse. "Africa isn't poor because they produce agriculture; it's poor because that's all they produce." McCollum and his partners were Peace Corps volunteers in Madagascar and, like most volunteers, felt they had gained a life-changing experience while giving almost nothing to their host country. So they looked for a product that could be made entirely in Africa. First they tried vanilla but quickly realized it had a limited market. But the world's demand for chocolate appears limitless. The former Peace Corps volunteers are selling their bars to national retailers like Whole Foods and Wegman's. The company has staff in Madagascar to work with farmers and supervise fermentation and drying, as well as monitor production at a factory owned by an African partner, which employs about 40 people. McCollum says, "They're doing everything from new product development to recipe development to actually making the chocolate." People may want food that's ethically produced, McCollum says, but those values don't help if the food is no good. "What they really want is better products. It all comes down to the quality." Has he succeeded? 'I don't want to sound coy here, but you'll know when you taste the product."